Happy holidays! Today, I made a small Japanese-style strawberry shortcake as a Christmas treat. Fresh, less sweet and the size is just suitable for two. Blueberries and mint leaves are from my tiny garden! Microwave butter and milk to melt. Whip an egg and sugar until stiff. Add 2-3 drops of vanilla oil, flour and fold the mixture. Bake the mixture in the oven for about 20min. While cooling the sponge case base, whip fresh cream with sugar and rum. Once the sponge cake base cooled, slice it in the middle. Spread a mixture of apricot jam and orange Curaçao on each section. Put sliced strawberries and whipped fresh cream between two slices of sponge cake base. Cover the whole cake with whipped cream and decorate the top and the plate with strawberries, blueberries, mint leaves and silver dragees. In response to The Daily Post’s weekly photo challenge: “Transition“. 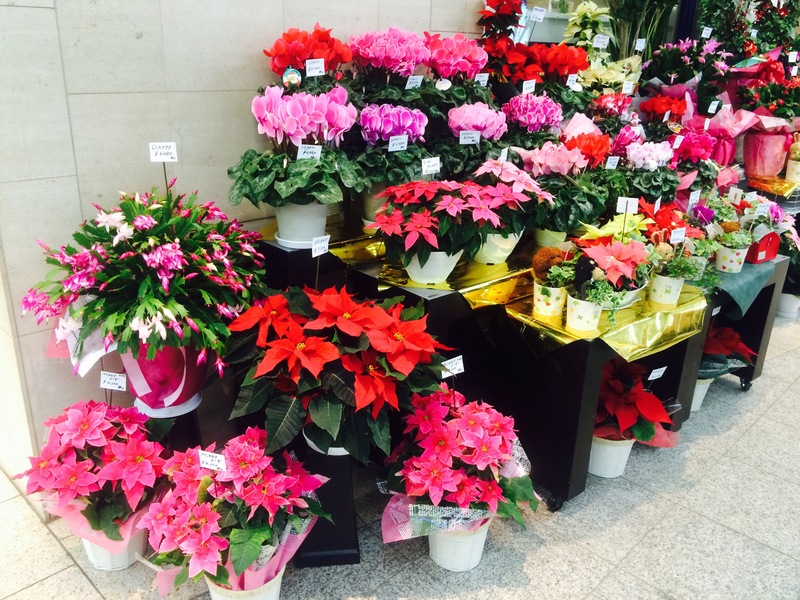 Cyclamens and poinsettias in crimson, red, pink, purple and cream in front of flower shops in this season are simply beautiful. It looks like a one piece of art transitioning its colors. Well, but it’s still a big mystery to me (and to most of the people, I believe) why there are many strange Christmas customs in Japan where most of the people are non-Christian. For small kids, it’s a day to receive a Christmas from Santa Clause. In the morning on December 25, they will find a gift (in most cases, they know what they receive because their moms make them write a letter to Santa Clause) near their pillows. Mothers prepare chicken dishes (Not turkeys in most cases. It’s even KFC in some families…) and so-called “Christmas cake”. I enjoyed it as a kid without any thought.